On our FB Page, we asked about local podcasts and you came through with quite a list! Here they are. They range from mostly geek related to horror to creatives to sports. If you come across an active Northern California podcast that should be included, let us know in the comments and we'll update the list. In most cases we used their own podcast descriptions. If you'd like us to update your description, just let us know. Please note: Some podcasts contain explicit material. He’s Got Issues: Comic book news, highlights and reviews. Fist Full of Potions / MultiTap Podcast: Fist Full of Potions = Gaming news and opinions. MultiTap = Gaming discussions from Now and Then. Geek Life: Comics, games, movies, zombies. All that and much more. Short Nerdy Guy: My name is jay and I love reading comic and drinking coffee, so I wanted to share my thoughts and my passion for these things that I love. Geek Charisma: For the love of geeks, tune in. The Gravy Age: Comic books, movies, and other geek news. The Capeless Crusaders: Geeky goodness, news and reviews. The Mouths of Madness: Horror, sic-fi, and all that. cinePLEXED: A podcast about movies. Each week a bunch of fools get together and discuss the latest movie news, rumors, and trailers coming out of the world of cinema, as well as reviewing two films that we sometimes pick at random, and sometimes pick with a theme. cinePLEXED is also slowly turning into the umbrella name for our little network of podcasts, because we can’t afford to put all of our shows in their own feed. The Junior & Leo Show: We explore the creative mind by talking shop with creators from a vast array of mediums. Actors, Writers, Comedians, Artists, Podcasters, Wrestlers, etc… we talk to them all! SacAnnex: Sacramento sports, opinion, and laughs. Geek Girl Crafts Podcast: We are three geek girls that love to craft and talk about our particular geek genres in excruciating detail -- from SF/F, conventions, anime, gaming, books, movies, and everything else in between. And then we'll talk more about costuming & cosplaying, fiber arts, and anything craft-related. A Podcast for All Intents and Purposes: Nerdly info, fun, and happiness. 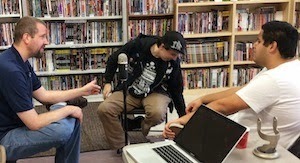 Empire’s Comics Vault’s Podcast, aka, Empire’s Open Podcast - Talking comic books, movies, television and other topics on the minds of the shop’s fans. The Nerd Sharks: Um. Nerds. Talking. It gets crazy. Game of Bros: This is what happens when Bros get together and talk while recording. Thank you for an amazing Free Comic Book Day and Month. This was our best year yet! We think there were a lot of great things about this year's FCBD. For example, Sacramento's most amazing mini-con, lots of free comics, a VIP line, title pre-selection for Savings Club Members, an enormous sale, a 10% Off Bonus Coupon for Savings Club Members, and more freebies each and every Saturday all month long. Oh, and this year, VIPs could bring a guest! We hope you agree about those positive aspects. If you can think of something else, please use our online feedback form. We heard there was some confusion between the difference between the regular line and the VIP line. We also heard that sometimes Savings Club Members were in the regular line and some folks from the regular line were in the VIP line. We already have a plan in place to fix that in 2015. 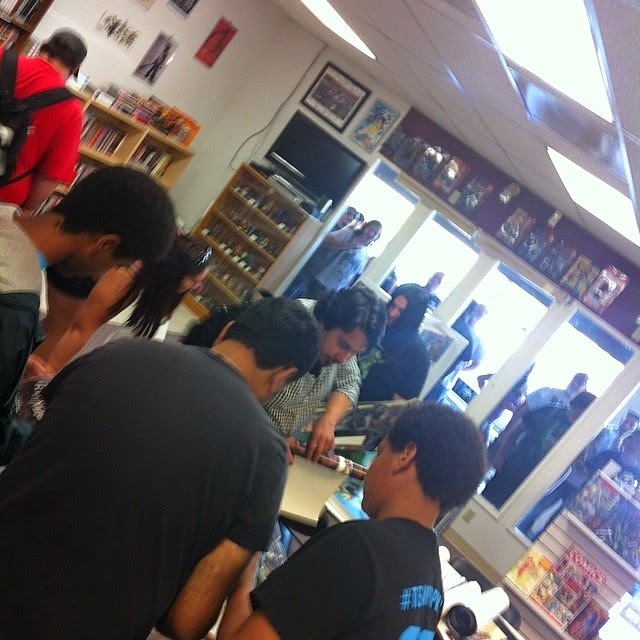 On some of the Saturdays during Free Comic Book Month, the lines took far too long -- especially on the last Saturday when we gave away free collected editions, trades and graphic novels. We're so sorry about that. You'll be glad to know that we've already worked out a plan to make that much smoother in 2015. If you'd like to provide any additional feedback, we'd appreciate hearing it. Please use our online feedback form. Look, Free Comic Book Day is for everyone. Whether you're a Savings Club Member at Empire's Comics Vault or not, everyone can enjoy free comics during Free Comic Book Day and Month. But if you really want to boost your experience, then definitely check out our Comic Book Savings Program. Children's reading ability has a tendency to slide during the summer months -- and not in a good way. We want to help with that. Of course, the Sacramento Library also has a summer reading program for children. Furthermore, the U.S. Department of Education has numerous tips on how to avoid the summer slide. This summer we're introducing Rolly's Summer Reading Program for children 12 years of age and under. When your children read 8 books of their choosing and submit the form, they'll receive a free comic book. * Plus, they can earn a bonus book by drawing and writing their own comic (details below). So, if your child participates in both parts of Rolly's Summer Reading Program, she or he could earn up to 4 free comic books. 1. 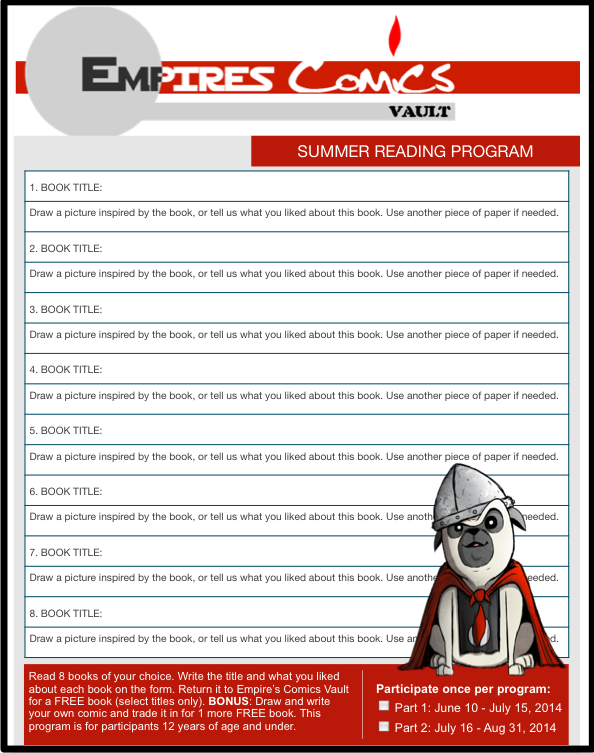 Print out the summer reading form. 2. Let your child choose each book he or she wants to read. It doesn't matter if the book is 32-pages with lots of pictures or 100-pages of text. Every book qualifies. It doesn't matter if the book is from your home library, the public library, or something you pick up at the shop (save with Rolly's Reading Club). 3. After reading a book, write the title on the form along with what your child liked about the book. Use a separate sheet of paper or a reading journal, if you'd like. Also, it's better if it's in your own child's handwriting. If you help a little, please make sure it's in your child's own words. As a secondary option, we'll gladly accept art inspired by the book. 4. Once the form is full, turn it in for a free* comic book from Empire's Comics Vault. 5. Bonus! Have your child write and draw his or her own comic book for one more free comic book. How? Take an 8 1/2 sheet of paper, fold it in half. Add art. Add words. If you're looking for more information on the subject, search the internet and you'll find plenty of great articles, research, and resources. *Free comics limited to select children's titles on-hand in Empire's Comics Vault's inventory.